This article contains a second video, below. I played my first full recital at 17. It took place in my parents’ living room, for about 30 of their friends, many of whom were musically knowledgeable. My piano teacher was also present, along with one of his top students. Two guests were very late, and while we waited for them to arrive I had to socialize with everyone, outside on the sundeck. While I made polite conversation, I agonized inside about whether I could get through the Beethoven Sonata, Opus 110, from memory, under all this pressure. Somehow, I did get through it. Somehow the whole program went really well. And when it was over, we enjoyed a wonderful reception, with wine and great food. About an hour after the last guests were gone, I went upstairs to my room and started screaming. My father, who was a pediatrician, came up and opened my door and said he’d seen this kind of thing in some women after they’ve had a baby. I was grateful that he had some understanding of what I’d been through, and I knew he was proud of me. I felt like I had accomplished a rite of passage. After midnight, when everyone was asleep, I went downstairs in my pajamas and celebrated my victory by smoking a cigar. I felt great. The huge challenge of performing does indeed put us through a lot. How DO we do it? All that practice, alone in a room, and then suddenly we’re out in front of people, and everyone is looking at us. We never know how we’ll do. We’re human. We can make any number of mistakes. Or we can simply fail to catch the spark of inspiration that could ignite our performance and connect us with our audience. We have every reason to be scared before we perform. Scientists have stated that playing a musical instrument is the most complex neuromuscular activity that people engage in. The extreme physical precision require to negotiate a masterpiece, combined with the deep sensitivity involved in responding to every sound, and the intelligence it takes to organize all these sounds in a meaningful way—all of it boggles the mind. And then all of those eyes and ears are on you when you present the music you’ve worked so hard on to an audience. In the practice room, you’ve repeated tough passages and elusive phrases countless times; now you have one chance—no matter what happens in any of those passages or phrases, you have to keep going. What is it that makes some performers able to handle this pressure and rise to the occasion? How can we train ourselves to go beyond our fear and become fearless onstage? To find the confidence that we truly have something to offer our audience, and to joyfully give it? Fearless Performing is my gift to you. I hope it will help you to not only give your own gifts but find out how deep and far-reaching those gifts are. For in developing the skill of fearless performing, you are developing what you already have within you. Even if stage fright is not a big issue for you, you may have another concern: You may sense that there’s more inside you than what comes out in performance and wonder if you could access it and communicate more powerfully with an audience. Listening to the small voice that says “maybe there’s more” can take as much courage as stepping onto a stage—because when you search for more within yourself, you enter unknown territory. You don’t know what the journey will be like, or if you’ll find the fulfillment you yearn for. And when you do break through to a new level of performance, you let go of familiar habits and old ways of seeing yourself. It can be disorienting. This e-zine is designed to encourage you to listen to that small voice and to go for the breakthrough you long for. No matter where you are now, there are new discoveries you can make, and you may find yourself in territories you didn’t even know existed. That small voice might herald the emergence of a bigger voice, filled with the joy and confidence that come from expressing your musicality on a more powerful level. As unattainable or mystifying as fearless performing may seem, I’ve come to see it as the result of mixing three basic ingredients: reliability, flow, and power. We need to rely on our abilities, we need to let go and flow in the moment, and we need access to our communicative power. The combination of these three ingredients will give you the balance you need when you’re out there in the hot seat, riding the unpredictable waves of your body, your mind, and the music. The short video that’s coming up in this article is designed to give you a glimpse of the first ingredient—reliability. In particular, it focuses on the first of two types of reliability: a reliable physical approach—what we usually call “technique.” The second aspect of reliability, intimate knowledge of the music you’re performing, will be the focus of a future video. Relying on your body to take you smoothly through a performance is absolutely essential. The nature of performing is that something bigger than you takes over. The energy of life itself floods your system, and all you can do is let go and let it happen. If your body is not thoroughly trained in all the intricate movements you have to make, it can trip you up. If your muscles tighten and the tension builds up in a particular passage, the body, and even the mind, can break down, and your performance can fall apart, or just fall short of what you want it to be. How we go about achieving physical reliability is crucial. We often work against ourselves, pushing our body so hard for the results we want that we get tense and the passage gets worse instead of better. We need to mix in the second ingredient of fearless performing, flow, as we search for reliability with our body. Very often, a musician’s physical approach is less efficient than it could be. Excess effort, excess movement, or a suboptimal position can easily create tension, which inhibits the free flow of the music. Streamlining your physical approach makes it more reliable. Streamlining your movements, releasing tension, and letting your body flow will prepare you for the intense state of flow that happens in performance. The more familiar you are with letting the flow happen in practicing, the easier it will be to handle it onstage. Future videos will show how to create natural physical flow in a variety of musical contexts. I hope you’ve enjoyed this first article in Fearless Performing. And I wish you much joy and success in making music. P.S. If you’d like to see me teach Phoebe in person, I invite you to attend my master class on Fearless Performing on February 9, as part of the Golden Key Salon Series at Klavierhaus, in New York (reserve a seat). This will be Phoebe’s second session with me, and the class will include a question-and-answer session at the end, in which you’re welcome to participate. You’re also welcome to check out my Technique Streamlining Package, or just come for a free consultation. Does your approach to performing apply to non-pianists? Yes. The fundamental principles of efficient body movement that I recommend apply to all musicians. In writing my book, The Art of Practicing, I interviewed several teachers of other instruments, as well as health professionals who help retrain injured musicians. It was heartening to discover that they all agreed with the same basic principles I teach for using the body to best advantage. Also, preparing for performance encompasses much more than the physical aspect. How we listen, how we train our mind, and how we treat ourselves as human beings, are crucial issues for all of us. Many non-pianists have asked me to help them release tension and get more in touch with their deep musicality, and I’ve been able to do that using a combination of basic physical principles, listening techniques, and mental exercises. How did you develop your understanding of fearless performing? It comes from all of my experience studying, performing, and teaching music, as well as from the training I’ve done in mindfulness and other meditative disciplines, and from a lot of research. I’m working on a second book, about performing, for which I’ve interviewed about 50 performers, including actors, dancers, and musicians. This book will present an approach to training the mind for confidence onstage. 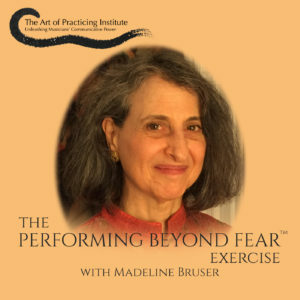 And later this year I plan to release an audio of “The Fearless Performing ExerciseTM,” which I developed to help performers access their communicative power before facing an audience. This entry was posted in Fearless Performing, Featured by Madeline Bruser. Bookmark the permalink.